The kids are finally settling in and getting the hang of procedures! My most un-favorite thing about starting a new school year is reteaching a new class all the procedures that make our day go smoothly. But, we're getting there! I've attempted to incorporate some of the componants of Whole Brain Teaching this year and I am AMAZED at the results. I cannot wait to learn more about it. So far I have introduced the rules (slightly modified), Class-Yes, Hands and Eyes, and Mirror. Powerful! The design is super cute and I really like the slight modifications to the rules. 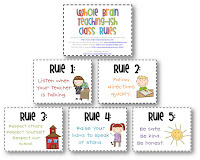 Go check out all her wonderful posts on Whole Brain Teaching! The busiest times of the year for a teacher are September, June, and the holidays. So when were all my kids born? You got it - September, June, and Thanksgiving. Today is my youngest son's 3rd birthday and all the child has wanted for months is a fire engine birthday party. Great! I can swing by the party store, let him pick out some cute fire truck plates and napkins, grab a couple of dozen cupcakes, drag it all into the preschool at the appointed time - and there you have it - birthday party, done! On to Plan B (there really was no Plan B). The boy insisted that fire engines be involved so I fused together a few Pinterest ideas with a few fire engine birthday parties that I've thrown for the other boys and came up with this. The preschool requires store bought treats and these fall themed sugar cookies were the perfect colors. And it was all under 20 bucks! I hope your students are settling into their routines, too! Have a great week! Hi! I'm a new folower and I just wanted to say I recently started whole brain teaching also! I'm loving it and looking forward to learning more! I know! I feel like my kids are so much more attentive this year! I am hearing so much about Whole Brain Teaching through other blogs - I am definitely going to look into it! I don't think it has made it to Australia yet! I am so glad I tried it! One of my first grade colleagues is giving it a try, too, and she is having similar results!